RAFAH, EGYPT (15 May 2011) - Joining a group of fellow activists traveling from Cairo to the Rafah border crossing, American activist, Aishah Schwartz, marked the 63rd Nakba commemoration among demonstrators waving Palestinian and Egyptian flags calling for the right of Palestinians to return to their homelands. The Egyptian-International Coalition for Ending the Blockade and Rebuilding Gaza, led by organizer and public affairs director, Ahmed Elassy, originally set out for the Rafah border in anticipation of fulfillment of the April 17 commitment made by Egyptian Foreign Minister Nabil El-Araby to facilitate delivery of goods and building supplies officially requested by Elassy for delivery to Gaza. The main objective of the Egyptian-International Coalition for Ending the Blockade and Rebuilding Gaza is to peacefully demand the permanent end of the Egyptian blockade of goods, services and building materials to the Gaza Strip. In an unforeseen twist of fate it was announced on Sunday that Al-Araby had been named as the new Secretary General of the Arab League, effectively side-lining what would have been a siege breaking event. Elassy's group was determined to remain hopeful of completing its mission but returned to Cairo on Tuesday, after an all-night sit-down demonstration staged Monday by a separate group of activists arriving through the desert, resulted in officials placing a ban on all non-traveling visitors attempting to reach the border. 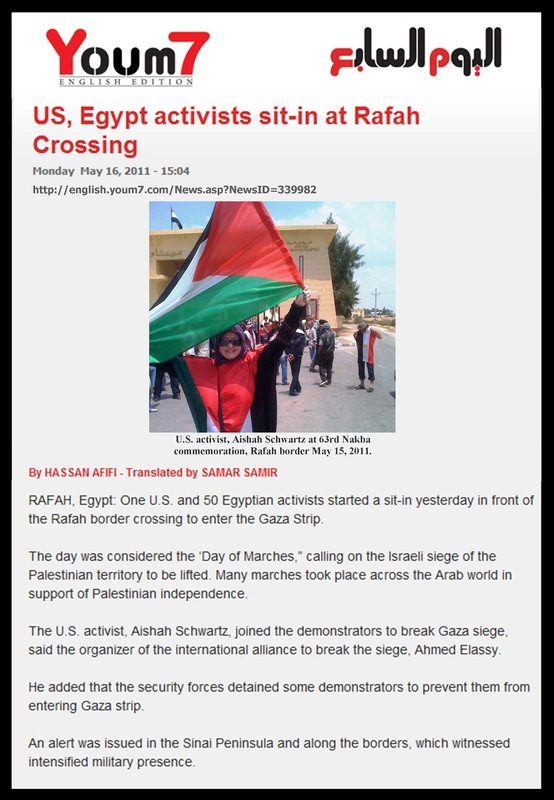 Thousands from across Egypt had attempted to reach the Rafah crossing to commemorate the 63rd Nakba, but an alert issued in the Sinai Peninsula and along the borders, resulted in an intensified military presence marked by travelers not identifiable as Sinai residents being turned back. The May 15 Nakba (translated as 'Catastrophe') Memorial Day commemoration marks the occasion during which more than 700,000 Palestinians - estimated today to number 4.7 million with their descendants - were pushed into exile or driven out of their homes in 1948. Additionally, Israeli forces destroyed more than 400 villages in their wake. يعتصم قرابة 50 ناشطا مصريا وناشطة أمريكية أمام بوابة معبر رفح تضامنا مع غزة، ومن أجل الدخول إلى القطاع للمشاركة بيوم الزحف لفك الحصار عن غزة. وقال أحمد العاصى، منسق التحالف الدولى لكسر الحصار عن غزة، إن النشطاء مازالوا أمام المعبر بمشاركة الناشطة الأمريكية عائشه شووركس. وأضاف أن قوات الأمن احتجزت الناشطين عند الحوجز الأمنية، ومنعت وصولهم إلى القطاع. وتشهد سيناء والمناطق الحدودية حالة من الاستنفار الأمنى والتواجد الكثيف للقوات المسلحة. Only a relatively small number of pro-Palestine activists seeking to commemorate the Nakba have arrived at the Rafah border crossing linking Egypt and Gaza, after the police and army blocked the main road leading to the town. 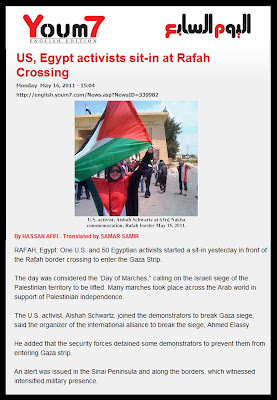 The activists said they had managed to reach Rafah by taking an alternative – and longer – route from Arish. They said Sinai residents gave them and reporters directions. On its official Facebook page, the Egyptian Foreign Ministry had urged citizens not to respond to calls for a march to Palestine, saying the current critical conditions in Egypt should be considered. Army patrols prevented activists from reaching the Rafah border on Friday and Saturday. The army also dispersed a protest before the Israeli Embassy on Friday by firing in the air. Activists said security forces arrested a number of marchers, while another group managed to return to Arish, where they held a sit-in at the Refaie Mosque. A military source in Port Said, meanwhile, said the army is intensifying efforts to prevent attempts by activists to infiltrate Sinai via Port Said. He added that ferries in Port Said only carry people with identity cards saying they are Sinai residents.